The Coen brothers, Joel and Ethan, have always had something of the smart aleck about them. Even such wonderful movies as Miller's Crossing and Fargo teetered on the brink of becoming mere smart aleck movies like Barton Fink and The Hudsucker Proxy. What saved them in their better movies was a sense of moral seriousness in the background—way in the background, at times—of all the fun. When the wisecracks and outrageously improbable visuals and cinematic tricks were there for some other reason than just making the authors look clever or cool they succeeded brilliantly, and when they were not, they didn't. With their newest film, The Big Lebowski, the brothers return to the theme of Fargo and try to accomplish the same feat again, but this time, they topple over the edge into the merely smart-alecky. Fortunately, the movie is so funny that most people will not care. For the moral seriousness of Fargo lay in the unexpected celebration of the stolid, boring, uncool goodness of the great American heartland which, like a cluster of white blood cells (the snow which pervaded every shot?) surrounds and finally overwhelms the invading evil represented by William H. Macy, Steve Buscemi and Peter Stormare. 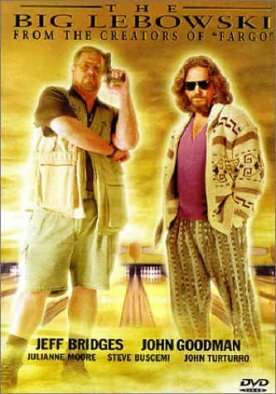 The Big Lebowski tries to take that vision one step further. Now the central image of goodness in the film is not a pregnant policewoman and her taciturn husband, “Norm,” but a dropout and a loser, a leftover from the '70s whose life consists of smoking dope, drinking beer and bowling. Instead of the Norm, we have “the Dude,” né Jeff Lebowski (Jeff Bridges), who may be a kind of Everyman among people of a certain age in certain parts of Los Angeles, but will still look exotic, I fancy, in places like Brainerd, Minnesota. Making the Dude the hero of yet another mind-bending kidnap-caper involving mistaken identities and double and triple crosses would not in itself be enough to spoil the film. Goodness has a way of popping up in the most unexpected places. But the Dude is too much the slacker to be either good or evil. He's just a screw-up, and his friends, Walter, a half-crazed Vietnam vet (John Goodman), and Donnie a village-idiot type (Mr Buscemi) are even bigger screw-ups. If this bunch manage to contain the mixture of weirdness and evil which surround them it is no tribute to their goodness but to their luck, as if—and here we get to the real moral point of the picture—the universe itself looks out for fools and drunkards. It is a time-honored conceit, but not one, I'm afraid, that can ever succeed in presenting itself in terms of moral seriousness. Besides, the weirdness/evil, again headed up by the sinister looking Mr Stormare, turns out to be as funny and as feckless as the Dude and his screw-up pals are. In other words, there is nothing much morally at stake in this movie. There are a lot of scam artists and threats of violence, but nobody really gets hurt except for one of the kidnappers, who gives up her own toe in order to make somebody think she is actually endangering the life of her kidnap victim, and one of the good guys, who has a heart attack and dies. This might have been a moment for dropping the comic mask for a moment and acknowledging that life is also real and earnest, but it just serves as the occasion for more jokes. Maybe Marge the policewoman in Fargo was out there for us sinners (though that would have been sailing a little close to the wind), but the Dude? I don't think so. To make him, however jokingly, into a Christ-figure is just flaunting the film's lack of moral purpose and a great shame. All that's left are the jokes, which are funny enough to make the film worth seeing, and occasional moments of brilliant characterization that make you regret all the more that those Coen boys are wasting their tremendous talents on trivial junk like this.